UPDATE— At ComplexCon on Nov. 6, Big Sean and Puma debuted their first collaborative sneaker. The khaki-colored shoe, called the “Breaker,” will be released in early 2018, at $105 a pair, as part of the company’s 50-year anniversary celebration of the iconic Puma Suede shoe. Big Sean is living in the moment — or the present, as he likes to call it, because life is a gift. And for the 29-year-old Detroit-repping rapper, 2017 is the gift that keeps on giving. In February, his fourth studio album, I Decided, debuted at No. 1 on Billboard’s Hot 200 chart. 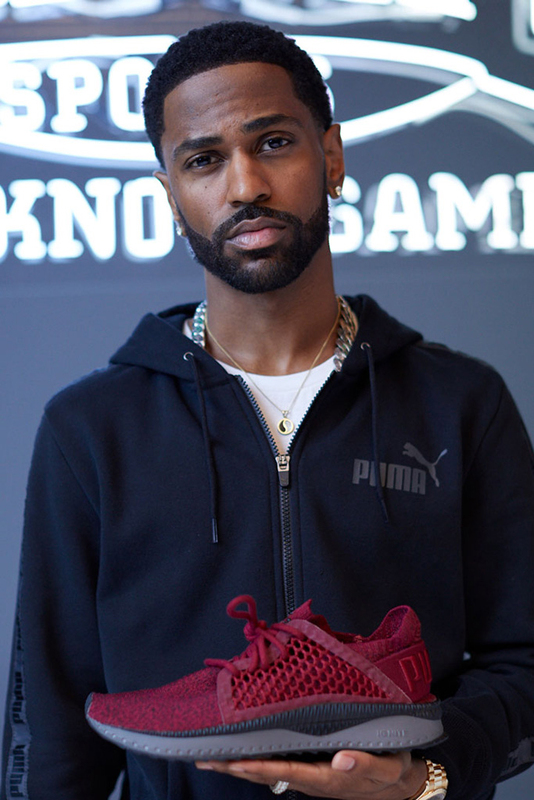 A month later, PUMA announced Big Sean as a global brand ambassador and creative collaborator after his five-year partnership with Adidas. And by April, Sean Michael Anderson became the youngest person in history to receive Detroit’s key to the city. Now, in the fifth and latest installment of Champs Sports’ “The Moment” series — which has featured athletes and musicians from Brandon Marshall, Julio Jones, Cam Newton and Dak Prescott, to rappers T.I., the Migos, 2 Chainz and Desiigner — Big Sean pays homage to his hometown while debuting the new PUMA TSUGI Netfit evoKNIT trainers, all to the tune of “Bigger Than Me,” the final track on I Decided. Before the launch of the campaign, we talked with Big Sean about his love for Detroit, the future of PUMA as well as the brand’s relationship with musical artists — and the new evoKNITs. How did it feel to get your own PUMA ad campaign through Champs’ “The Moment”? It’s real cool. I’m happy I got a chance to do the campaign. And obviously people have been going to Champs forever. I used to go to Champs in Northland Mall. … I think it was the first mall built in the country, because the automotive industry was popping way back when. … It’s closed now. It closed down probably a few years ago. But that’s where we used to go to get the new shoes. What story did you share through the campaign? It’s another opportunity to highlight where I’m from, my city, and some of the great times I’ve had here throughout my life, throughout my career. What makes “Bigger Than Me” the right song for this? I don’t know if that’s for me to answer. … But for me … it’s just something I kept it real on. I really think about the music I make and the message I want behind it, and what it means to me. … I grew up with a lot of people in the D who didn’t have parents, or they only had one parent and may not have even had role models in their life. Sometimes people just need that guidance, especially from people they look up to. I used to have a list of rappers and musicians I looked up to that kept me going and gave me inspiration. So when it was my turn, I wanted to give that too. That’s not necessarily my responsibility, but that’s just something I want to do. If you can give somebody inspiration, that’s the greatest gift you can give — probably even greater than money, because [inspiration is] going to take them further. That’s all I was doing with ‘Bigger Than Me,’ and a lot of the songs on I Decided. I … made that album specifically for the dreamers. I was really happy I got to give something that people could hold on to, who really needed it. How was your first year representing PUMA? What I love about PUMA is that I feel like they’re on an upswing. They’re already a respected and loved brand, but … they’re really focusing on how to take it even further. I just respect working with people who wanna just keep going up. I feel like it’s synonymous with myself, too — I’m still just going up, and I like that we’re on the same mission together. I’ve dealt with other brands, [but] I feel like this is how it was always supposed to be. I’m sitting here designing my first collection. We’re working on shoes and apparel, and not only do they respect my ideas, but they want to really make them work; that’s something I’ve never experienced from such a big corporation before. That’s how it should be. When the people who wear the brand, rep the brand and make the brand popular can be business partners too, it’s the wave of the future. Like what they’re doing with Rihanna, The Weeknd and myself, among others, the approach is smart because it doesn’t just make you feel like they’re going to pay you this money to wear their brand. It feels way more natural, and it makes me — and I can only speak for myself — but it makes me really want to work with them more. I really appreciate the dynamic and the relationship. I’m excited to work with PUMA, and I think it’s the start of something legendary. There are several artists who are PUMA ambassadors. What is it about the brand and its products that is so attractive to musicians? It’s just a new time. It’s a new day. And PUMA is just right there with the new ways of thinking, the new styles. And I’m speaking for myself, but I’m sure The Weeknd and Rihanna would agree that there’s nothing forced about it. It’s a natural partnership. As time goes on and we execute more ideas, I can’t wait to drop my collection, and even my own shoe. Those are things that a lot of these companies aren’t doing. It’s something that PUMA does — they listen to their consumers, and what the people want. What the culture is saying. I think they try and meet those demands, and that’s something I respect. You know, I respect them trying to take it to new heights and new levels, because that’s all I’m trying to do. It’s nothing but love and respect, and I think that’s why I fell for them. What’s your favorite all-time pair of PUMAs? The black-and-white Clydes, the red-and-white Clydes, the super PUMAs, all the white/cream Clydes. 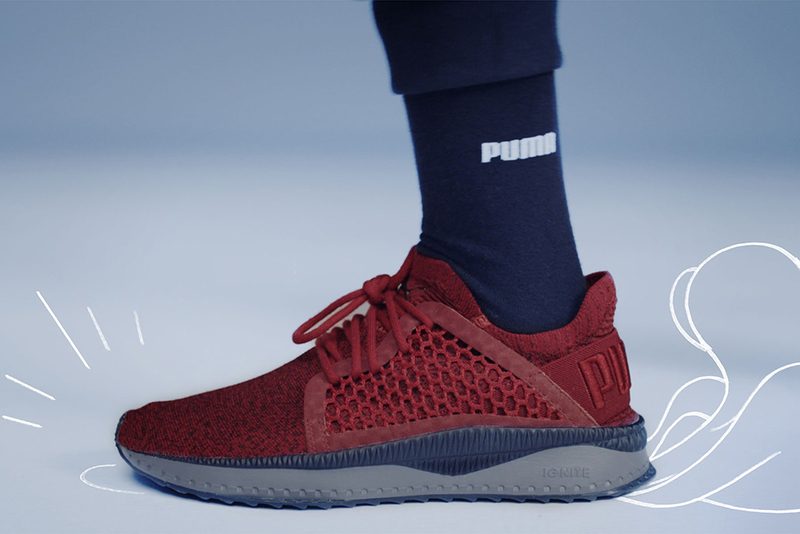 Tell us what you like about the PUMA TSUGI Netfit evoKNIT? I like the trainer aspect of it. And aside from it being comfortable, it just looks cool. Obviously it was just easy for me to self-premiere it with the campaign. It made sense. So when it came across the table, and I found out I could help debut it, it was definitely good news for me.